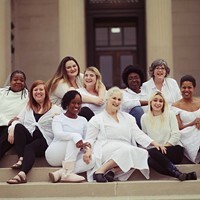 Ogre the Moon | Theater | Style Weekly - Richmond, VA local news, arts, and events. Theater Review: Virginia Rep’s “Shrek” musical is big, splashy fun. Kids and their parents will probably recognize these faces from their assorted video screens: Shrek and the Donkey — brought to life at the Children’s Theatre of Virginia at Willow Lawn by actors Jason Marks and Ronnie Brown. When they green-lighted "Shrek the Musical," you have to wonder if the folks at DreamWorks ever worried about oversaturating the market with their irascible ogre and his merry band of misfits. From William Steig's original children's book "Shrek!" DreamWorks created a hugely successful computer-animated film, three full-length sequels, television specials and a spinoff feature flick. By the time this Broadway musical hit the stage in 2008, the characters and machinations of Shrek were firmly ingrained into pop culture. Would the gates of Duloc still retain their magic draw? Luckily for Richmond audiences, the answer is yes. 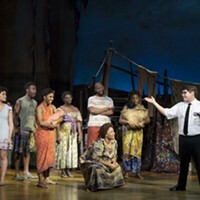 In hiring Pulitzer-winner David Lindsay-Abaire to handle book and lyric duties, and Jeanine Tesori to compose, DreamWorks oversaw the creation of a lively and inventive take on its handiwork. In the musical, Lindsay-Abaire and Tesori have returned to the origin story from the first film. To retain possession of his swamp, Shrek makes a deal with the evil Lord Farquaad: The ogre keeps his land as long as he rescues Princess Fiona from a tower. All goes according to plan until Fiona and Shrek start to have feelings for each other. 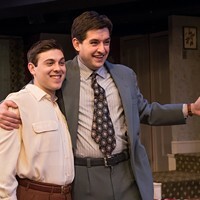 In bringing this clever work to the stage, Virginia Repertory Theatre has stacked its cast with some of the most well-known talent in the city. 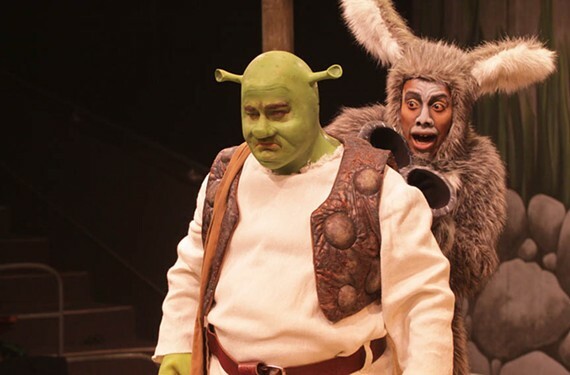 As Shrek and Donkey, Jason Marks and Ronnie Brown create an amusing comic team, with Marks affably and energetically portraying the big green guy. Brown is very funny, though his portrayal essentially is a slightly toned-down version of Eddie Murphy's original film version. As Princess Fiona, Aly Wepplo's comedic chops are on full display in songs such as "Morning Person." And though the character of Lord Farquaad might be short of stature, taking on the deliciously evil megalomaniac is no small task. With plenty of humor and impressive vocals, Robert King plays this dastardly role with aplomb. In a smaller but important role, Ashlee Arden Heyward adds some vocal pyrotechnics as the R&B-belting Dragon. 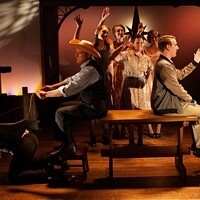 The supporting cast is equally talented, and director and choreographer Robin Arthur effectively uses them to create one show-stopping spectacle after another. The show also has an incredibly high production value, with Elizabeth Weiss Hopper's colorful and elaborate costumes suitably fitting the storybook characters. From Lord Farquaad's Disneyland kingdom to a chapel with a breakaway stained-glass window, Brian C. Barker's sets playfully add to the proceedings. Virginia Repertory Theatre's "Shrek the Musical" plays through April 27 at the Children's Theatre of Virginia at Willow Lawn, 1601 Willow Lawn Drive. For information, visit va-rep.org or call 282-2620.